Last December, I was reading about American artists, especially women. I ran across a small, 1994 article that appeared in the Hartford Courant (Conn.,) newspaper about a local, 18th century oil painting sold for $145,000 by Sotheby’s. Its sale was to benefit the rebuilding fund for the library. The work was considered rather rare because (1) it was painted by a woman, Sybil Huntington May (1735-1798), and (2) because it was of a landscape--not something that was ordinarily painted. May was an artist in her own right and yes, that was very uncommon in those days. Women, if they participated in art at all, usually created embroidery, which would require some drawing (if not created by handed-down patterns) and color management. Interestingly, I did find an article regarding one of her early paintings: a portrait of the Duke of Cumberland, England, done with oil on wood, and completed by Sybil in 1750. She was only 15 years old when she completed this portrait! Unfortunately, I could not find the painting online, just a mention of it from the Buffalo Historical Society. May must have had some sort of following though since a local merchant exhibited her work for sale when she was young. The story goes that her future husband, Reverend Eleazer May, was in a shop one day and noticed some small paintings for sale. He was smitten and wanted to meet the artist. In time they married and with it, she set aside her brushes and paints to serve the needs of her husband, family and parish--or at least the tale goes. But she didn’t put those paints away immediately, because in 1758, after the church and parsonage were built in Haddam, Conn., May took a wood panel in hand, most likely stepped outside and painted the landscape before her. The piece is believed to be the first ever American landscape created by a native-born colonist. As with many paintings and embroideries of the 18th century, this painting would grace the space above the fireplace mantel. Many of them were called over-the-mantel paintings or “overmantels.” If May had given the painting a name, it has been lost to time, so today it is referred to as: Connecticut River Flowing Past the Church at Haddam. Overmantel Painting, oil on panel, Haddam, CT, c. 1758. As we have learned through this series, landscape painting was unheard of in the 18th century—historical and portrait paintings were all the rage. So it’s somewhat unique that not only did a woman paint this scene, but to be the first to do so in the colonies. However, according to the Antiques & Fine Arts Magazine (AFA), another artist by the name of Winthrop Chandler (1747-1790) is supposed to be the first American landscape artist, noting that there may have been some before but not native-born. And oh, yes, there was this gal named Sybil Huntington May, but she only created one piece, so that's considered unimportant. Sorry, I think the first is the first, no matter how many more paintings you create later on. What’s more, I’m not quite convinced that Sybil stopped there. 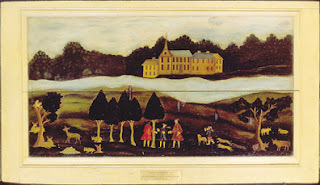 Years later the parsonage burned down and it was just by good fortune that this landscape painting survived. In my mind, it is perfectly possible that she had a lot more of her paintings in that house but was only able to save the one. Besides that, I read that May was supposed to have given art lessons to John Trumbull (who was to become one of the greats in American painting—more on him later). Again, if this is the case, was art still part of her life, but because she was a woman and now a pastor's wife, she could not commercially pursue her passion? Hmm. We'll never know. It’s a real shame that women were not given more credence in the past because I think there is a whole other story to tell about what went on artistically with May. But to add more to the fire, I’m planning on sharing the life and tragic death of another female artist, Faith Trumbull, in next month’s issue. Another brilliant early-American artist nobody really knows.